This past week I’ve had an online conversation with a fellow blogger on the topic of “limited atonement” and “total depravity.” Because of the nature of this topic, these discussions are usually fruitless and typically degenerate into “profane and vain babblings” (2 Timothy 2:16), which we should shun. At issue is the tension between the sovereignty of God and the free will of man. Calvinism (falsely attributed to the reformer, John Calvin) defends five points characterized by the acrostic TULIP: (1) Total Depravity, (2) Unconditional Election, (3) Limited Atonement, (4) Irresistible Grace, and (5) Perseverance of the Saints. Calvinism champions the complete sovereignty of God, and hyper-Calvinists go so far as to assert that God literally picks and chooses who will go to heaven and who will go to hell. On the other side of the argument is Arminianism, attributed to the Dutch theologian Jacob Arminius. Arminianism counters Calvinism with eight points: (1) Universal Prevenient Grace, (2) Conditional Election, (3) Unlimited (or universal) Atonement, (4) Resistible Grace, (5) Uncertainty of Perseverance, (6) Libertarian Free Will, (7) Equal, Impartial, and Undifferentiated Love, (8) The Universal Call of Salvation. The conflict comes when one takes one position or the other. Both positions have scriptural support, and both have scriptural weaknesses. Contrast Calvinism’s “Total Depravity” with Arminianism’s “Universal Prevenient Grace.” The former considers individuals dead in sin so that they are incapable of choosing God’s free gift of salvation apart from God’s direct intervention on their behalf. This can be supported from Ephesians 2:8 where the Apostle Paul says in effect that the faith required to accept God’s Grace is in itself a gift of God. The latter acknowledges man’s fallen condition, but suggests that Grace “restores man’s free will which was impaired by the effects of original sin and enables him to choose or refuse the salvation offered by God in Jesus Christ.” This too has scriptural support in “the Lamb slain from the foundation of the world” (Revelation 13:8). Or contrast Calvinism’s “Unconditional Election” with Arminianism’s “Conditional Election.” The former says that God picks who will be saved, the latter basically says that God “elects” or chooses those who choose Him. Both of these concepts find support in Scripture. Jesus said, “Ye have not chosen me, but I have chosen you” (John 15:16), but, of course, it could be argued that Jesus, in context, was speaking to His disciples, and as such it is not a blanket statement covering all believers. The Arminian challenge to this would be: “Then what do you do with all the ‘whosoever’ passages in the New Testament?” The Calvinist would then argue in a circle and say that all the “whosoevers” are the elect, but that also contradicts a lot of Scripture. In Calvinism, “Unconditional Election” and “Limited Atonement” go hand in hand. The former specifies God’s sovereignty in “electing” who will be saved and “Limited Atonement” explains that Christ’s sacrifice, while having universal application, is only efficient for those who are elect. They are really two sides of the same coin. Arminianism challenges that with “Unlimited Atonement.” Since Jesus died for all, then all have equal opportunity to respond to the Gospel by the exercise of their free will. Calvinism responds that those who respond to the Gospel do so because Grace, the “call of God,” is irresistible to the elect; they cannot help but respond to the Gospel message. The Arminian would retort that Grace certainly is resistible, as is frequently proven in evangelistic encounters. Anyone who has shared their faith with an unbeliever has experienced the disappointment of bringing someone to the point of conviction and then having them reject the invitation to accept Christ as Lord and Savior. Some say, “I’m not ready now.” Others will say, “Perhaps when I’m older.” Still others may say, “I don’t want to offend my family or my friends.” The offer of God’s grace certainly can be rejected. Of course the Calvinist would counter with, “That’s because they aren’t elect” – again arguing in a circle. This discussion could go on and on, and countless reams of paper have been spent in defense of both sides. Both sides have good points, and both sides have weak points. The answer to the debate lies somewhere in the middle. Only God knows the real inner workings of His plan. “For my thoughts are not your thoughts, neither are your ways my ways, saith the LORD. For as the heavens are higher than the earth, so are my ways higher than your ways, and my thoughts than your thoughts” (Isaiah 55:8-9). In the end, both Calvinists and Arminians have to come to Christ in the same way: “Believe on the Lord Jesus Christ, and thou shalt be saved” (Acts 16:31). “That if thou shalt confess with thy mouth the Lord Jesus, and shalt believe in thine heart that God hath raised him from the dead, thou shalt be saved” (Romans 10:9). There is one point where the Calvinists get it right and the Arminians get it wrong, and that is the fifth point of Calvinism: “Perseverance of the Saints” vs. the Arminian “Uncertainty of Perseverance.” “Perseverance of the Saints” is the idea of “once saved always saved.” The Arminians object to this based on observation. They may observe someone who claims to be saved living as a pagan. First of all, I would remind the Arminian that “the LORD seeth not as man seeth; for man looketh on the outward appearance, but the LORD looketh on the heart” (1 Samuel 16:7). Secondly, if salvation is based on man’s own effort, however that may be defined, that “salvation” is not genuine. Ephesians 2:9 tells us that salvation is “Not of works, lest any man should boast.” But when Jesus does the saving He says, “My sheep hear my voice, and I know them, and they follow me: And I give unto them eternal life; and they shall never perish, neither shall any man pluck them out of my hand” (John 10:27-28). Yes, Christians can sin and not lose their salvation. The difference is that the one who is truly saved, cannot continue in willful sin. Either the Christian will readily recognize his sin and immediately repent and ask forgiveness, or the Lord will allow the Christian to continue in his sin until the consequences of his sin bring him to the recognition of his sin that brings about repentance. If the sinner never comes to that point, he has probably never been saved because Jesus says, “My sheep hear my voice.” Either he belongs to Christ or he does not. So, as I tried to show, the true answer to the Calvinism vs. Arminianism controversy is somewhere in the middle, and only God knows the exact details of His plan. Our task is to present the simple Gospel message, allow the Holy Spirit to do His work, and leave the details of how God accomplishes His plan to God. See my post “Impossible” of September 2, 2012. It’s actually not correct to say that in Calvinism election and limited atonement go hand in hand. Not so for Calvin, Luther, and nearly all of the original Reformers, not so for the English delegates at Dort, nor for the Bremen delegates, and others also at Dort. And not so for many Reformed theologians in the 17th century down into the 19th century, such as Stephen Charnock, Richard Baxter, John Howe, down to Robert Dabney and many others. If the link goes through under my name here in this comment, check it out. If not, click on the link connected to my wordpress name and go to my research site, click on main index tab (top) and then click on the “for whom did christ die” index. Before that they may used the phrase “Five Points of Calvinism” however, back then that was way more open ended in terms of what were the 5 points, or how anyone one point was defined. Shedd for example, would have affirmed the language and yet held that expiation was for all mankind–none excluded–yet redemption was limited to the elect. Shedd was part of the New School movement which generally distinguished between expiation/atonement which was universal, and redemption which was limited. Dabney on other hand, while holding to New School theology, but remaining in an Old School Southern Presbyterian denom,, thought the phrase was inaccurate, while at the same time, like Shedd, held to unlimited expiation and limited redemption. For these two men, the limitation is only in the redemption, the decree to apply the (unlimited) expiation, not in the expiation/atonement itself; which is for all men. So there was a lot more complexity and diversity back then. But with the coming and dominance of “TULIP” the terms are now defined explicitly which locks in any theological discussion. Dabney would have scoffed at the “TULIP” and Shedd would have rejected it. TULIP though has shaped much of popular modern discussion and language. Its reductionist and eclipses out complexity. TULIP is the modern Reformed community’s equivalent of the old Four Spiritual Laws. 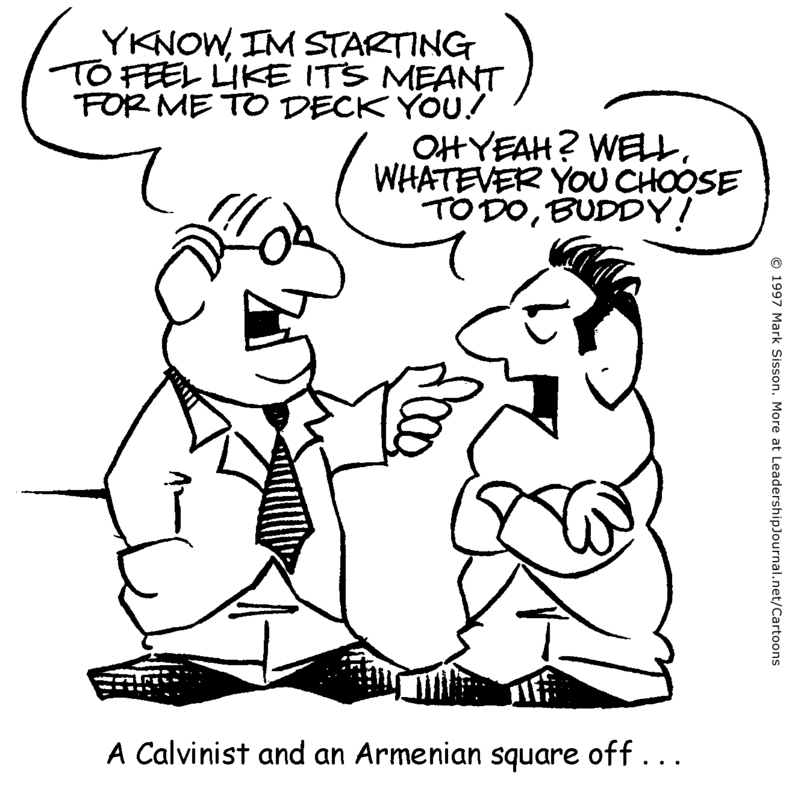 Byw, the cartoon misspells Arminian. Armenians are a group of people living in the Caucasus area.